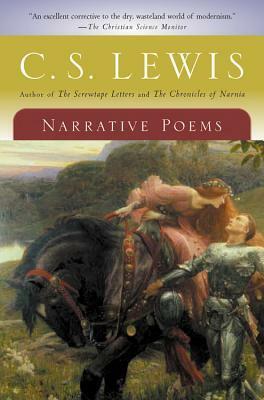 A while ago I enthused over "The Nameless Isle" and other little-known poems of the fantastic by C. S. Lewis. I've just read "The Nameless Isle" again, in its new berth as "In a Spring Season I Sailed Away," printed in The Collected Poems of C. S. Lewis: A Critical Edition, edited by Don King. * It's so good it rejoices me. I don't seem to find a thread, any time recently at least, at Chrons for fantastic verse, so let's have one. You could go all the way back to Homer, but the modern vein of fantastic verse might be considered to begin with Coleridge -- The Rime of the Ancient Mariner, Christabel, "Kubla Khan " -- and to include Poe and others in the 19th century, etc., and then Tolkien and C. A. Smith and others in the 20th. Here's a place to discuss poems that you've read. Is anyone successfully writing fantasy narratives in poetic form now? But I urge Chronsfolk to get hold of the Lewis poems, in the new King edition or the earlier edition of Walter Hooper titled Narrative Poems, which was reprinted in paperback. Good public and university libraries should have one or the other. I am convinced that there are many readers who would enjoy "The Nameless Isle" (as Hooper titled it) aka "In a Spring Season..." (King's title, drawn from the first line). It would deserve to be issued as a book in its own right, if only Walter Crane could be the artist in his Faerie Queene vein. *The physical production of this book really deserves praise; it's bound in a black material and the lettering and design are gold-stamped in a way that remind me of the old Arkham House fabric -- "Holliston Black Novelex" -- and gilt letters. Maybe this would be a good place to compile a list of outstanding poems of the fantastic from 1800 to today. I've just reread "Launcelot" (the Narrative Poems title) now printed as "When the Year Dies in Preparation for the Birth" (Collected Poems). I believe the poem has been considered to be unfinished, but I'd question that. As it stands it ends on a shocking, macabre note, and Launcelot's return to Camelot may be inferred. Do seek it out.